Next, on a very special "Wayne's World"
11 Responses to Next, on a very special "Wayne's World"
“Slave Girl Comics”. I still can’t get over that. I had to find out about this. The fact that Slave Girl Comics only lasted two issues gives me some hope for humanity. I believe the two issues were reprints of previously serialized adventures of Malu the Slave Girl that appeared in other Avon publications. I know I’ve read these stories before in one of the other Golden Age comics I’ve been through, though I can’t recall which in particular. Why are all the people in these panels so far away? 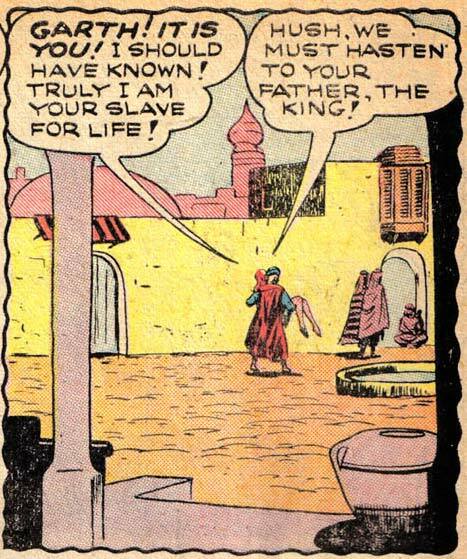 And thusly, Superman of the Arabian Nights’ secret identity–Garth Kal-el–has been revealed to all and one. So, Jeff, you running out of Power Users? Because I’ve got an idea if you are. Go back to the first ones you did, which have got to be at least a year old, and ask them again to see how they’ve progressed. Should be fun!